Brother Octopus is an Edmonton, AB duo comprised of Brother Octopus and the tambourine-wielding Lady Friend. 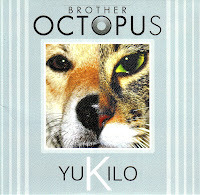 Their debut EP, Yukilo (named after a dog Yuki and a cat Kilo), comes out on May 8th. Checking in at 5-songs and a mere 13-minutes, it's a blink-and-you-miss-it kind of affair. Bookended by the short harmonic "Yuki" (0:43) and "Kilo" (0:59), it really comes down to a three song sample. The arrangements add synthesizers and other electronics to more traditional folk instrumentation. The arrangements are not what stands out on the record, however. It's the sense of humour in the lyrics that is most appealing. Lines like 'Little Mermaid 3/that went straight to DVD/an epic fail from Walt Disney' (from "Underwater Mysteries") and 'you're an old computer/still running Windows '95' (from "Old Computer") are the kind of thing you'd expect from The Magnetic Fields. In fact, if it weren't for the lyrics, "Old Computer" would be downright dull compared to the hooks in "Amusement Park" and "Underwater Mysteries". In the end it's hard to judge Yukilo. The sample size is small, but it shows hints of great potential. Best tracks: "Underwater Mysteries", "Amusement Park"